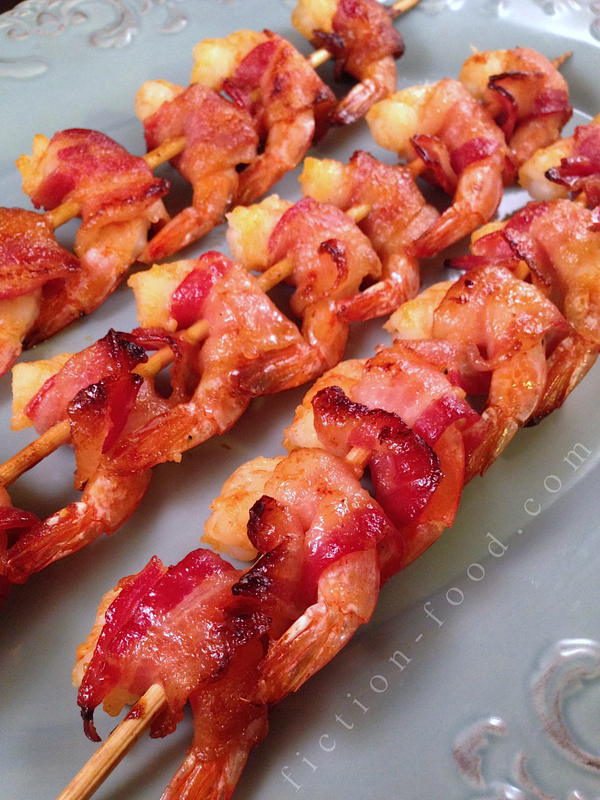 Fiction-Food Café: Bacon Wrapped Shrimp for "Parks & Rec"
Bacon Wrapped Shrimp for "Parks & Rec"
In honor of NBC's clever and hilarious show "Parks and Recreation", which airs its final show tomorrow night, have yourself some Swanson approved treats! These savory little guys show up several times throughout the series; beginning, middle, and end. 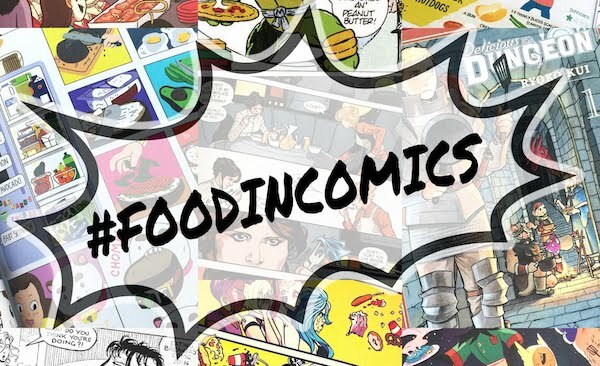 wrapped around my number three favorite food." 1. Soak bamboo skewers in water for about 20 minutes. Preheat your oven to 400ºF. Line a large baking tray with foil & lay 2 wire cooling racks across the top. Place the bacon strips (cut in half) on top of the wire racks on the tray & bake for about 6-8 minutes on the middle oven rack (you only want to cook the bacon about halfway). Remove from the oven (leaving the oven on) & let cool enough to handle. Pat the strips with paper towels to remove most of the grease. 2. Pat the shrimp dry with paper towels & sprinkle them with lemon juice & salt. 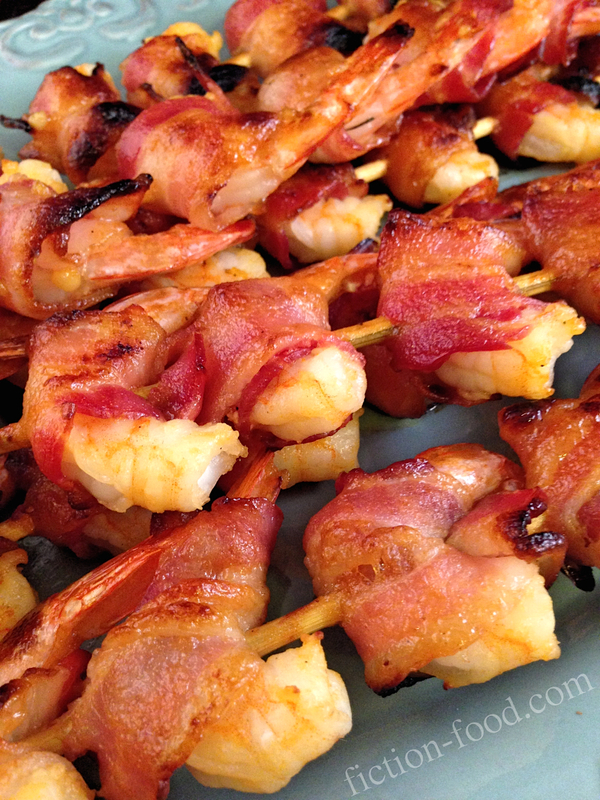 Wrap each shrimp with a half strip of bacon & skewer, putting 7 shrimps on one skewer (the skewer will keep . 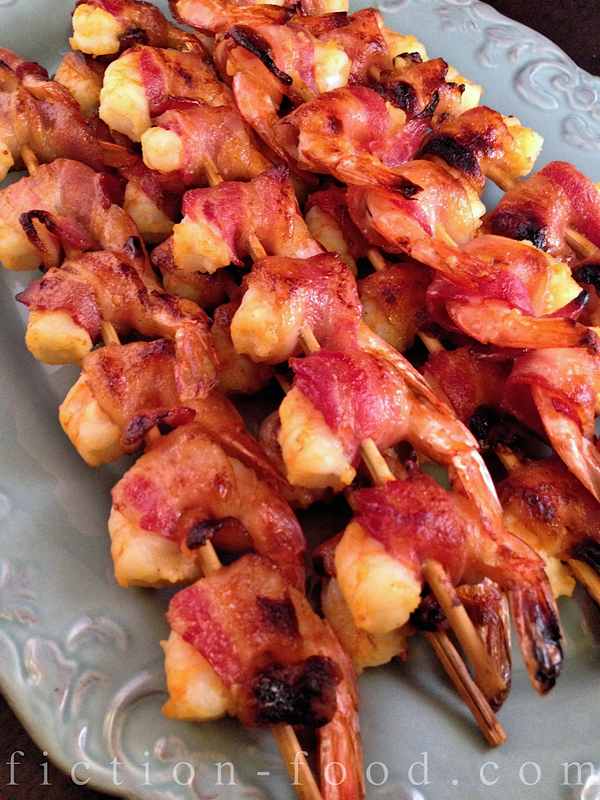 Lay the loaded skewers on the tray with the wire racks & brush the tops of each wrapped shrimp with BBQ sauce (optional). Bake on the middle rack for 5 minutes. Pull the tray out of the oven, turn the skewers over, & brush each shrimp with the rest of the sauce (if you're using sauce). Bake for another 5 minutes & then turn on the broiler & bake for a couple of minutes, until the bacon is crispy. Turn the skewers again & broil for a couple of minutes more to crisp the other side. Remove from the oven & let cool enough to handle the skewers before serving.